I’ll be the first to admit my middle school musical tastes could be categorized as “pop punk” at the very least. With their slick emo-kid hair, eyeliner and slightly-angsty-and-unnecessary exclamation point, Panic! At The Disco was a staple band in my neon blue iPod shuffle. However, as I grew up, Panic! fell off of my radar. What was once a top-played artist turned into the band one of my coworkers plays every time we work together (and I mean every single time). But Panic’s April 9 concert at the KFC Yum! Center solidified my growing notion that as I matured, so did Panic! – well, kind of. As the crowd slowly filled in for Louisville’s part of the “Death of a Bachelor” tour, I realized that, while I’ve grown up, Panic’s target audience hadn’t. Teenagers donning band tees, all-black clothing and brightly dyed hair made up about 70 percent of the audience. Two girls behind me were making fun of someone for “stealing all of her quotes from Tumblr.” The available merchandise, mainly black, gave similar vibes. After strong opening acts by Saint Motel and Misterwives, the band hit the stage around 9 p.m. to two massive bursts of gold confetti, ready to knock out a 20-song set list. The majority of the first songs were fresh off the “Death of a Bachelor” album, a Frank Sinatra-themed album. Lead singer Brendon Urie proved he was the perfect crooner-pop punk combination, and made sure everyone knew it by the end of the show. Throughout the show, Urie hit notes my coworkers and I could only dream of hitting in our post-close Panic! jam sessions. And when he did, the crowd, for lack of a better term, panicked. His stamina and vocal dominance were truly incredible. For example, in the middle of the show, he sang half a song, did a backflip, finished the song, came back out on a piano, took a shot and sang two of the more vocally challenging songs of the night – “This is Gospel” and “Death of a Bachelor.” I know he does this for a living, but I was still impressed. 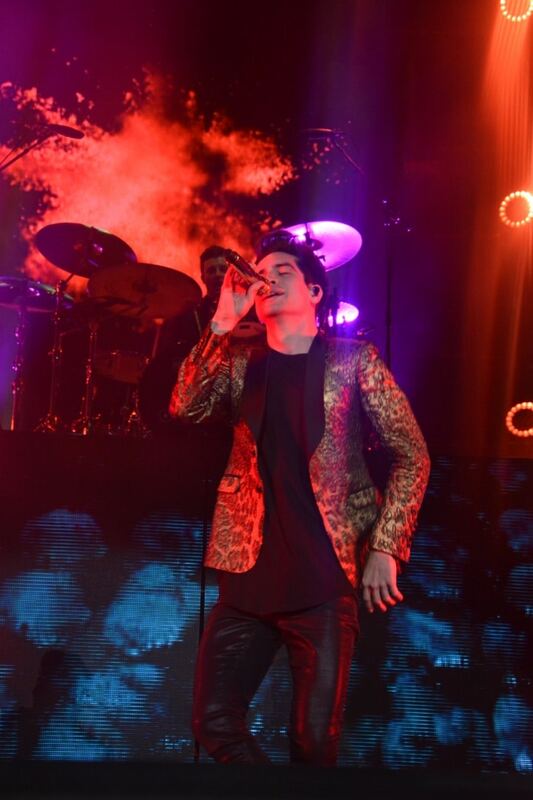 Urie’s vocal range seemed to carry the squad. I’m not dissing the band, but if Urie offered to make the tour an a cappella act, I think everyone would have still gone. Later songs in the set, like a cover of Queen’s “Bohemian Rhapsody,” were just as strong, but reminded me of a basketball team dunking when they’re up by 20 in the final two minutes. We get it – you’re talented. But the second I started to become salty, Urie provided one of the most genuine thank you’s I’ve ever seen at a concert, and suddenly my salt was gone. The band ended the concert with the past and the present, with “I Write Sins Not Tragedies” representing the scene-kid days and “Victorious” representing the now. While the crowd and merch hasn’t matured, their sound has. The pop punk sound remains, but has been toned down, allowing Urie’s voice to appear stronger and brighter.